Fairhurst was commissioned by Durham County Council to undertake environmental improvement works at Craghead, County Durham. Proposals included streetscape improvements, the creation of car parking areas and a new public space. Subsequently the client asked Fairhurst to provide a regeneration masterplan for South Moor based upon a similar design brief to incorporate SUDs. The project was developed in close collaboration with the immediate community and affected local stakeholders through hands-on workshops to ensure that sensitive and effective measures were drawn up. Local school input was also incorporated into the designs. Work completed ranged from overall strategic planning, site analysis, in depth consultation, policy review, public realm design and contract administration. Work was completed in parallel with other active projects on site, which were concerned with improving energy efficiency and the aesthetic appearance of the residential properties. This demanded close and maintained dialogue with other consultants and relevant statutory consultees to ensure that a coordinated design approach was achieved. Through the life of the project Fairhurst developed strong working relationships with Durham County Council and is currently designing similar proposals for environmental improvements in South Moor. 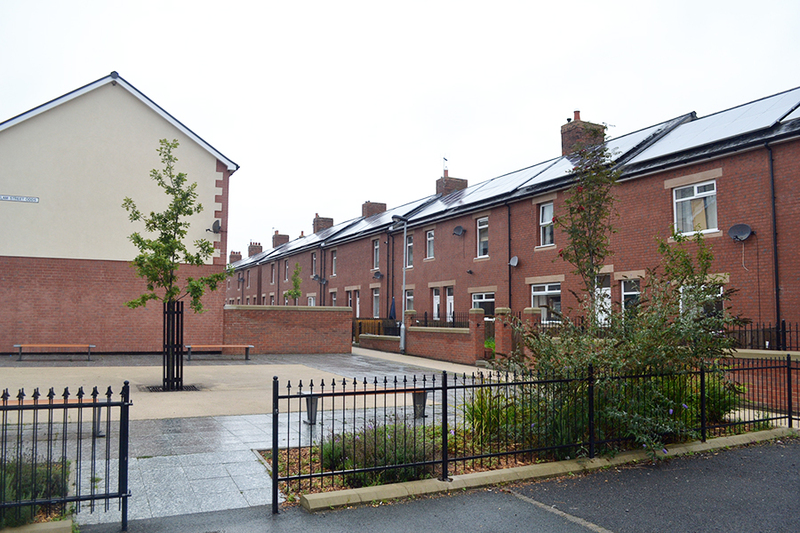 The scheme has been awarded an RTPI regional award.